HTML5 media player is a jQuery CSS3 based HTML5 media player for streaming video and audio with a manageable player and playlist for webmasters. 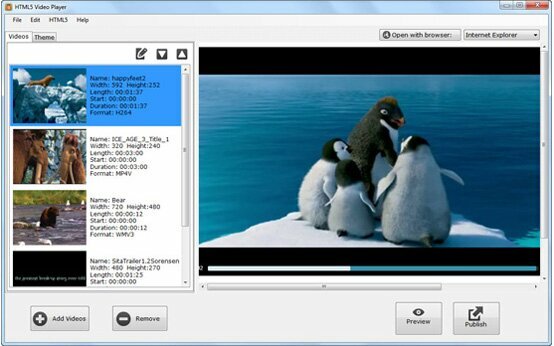 The HTML5 media player allows you to drag and drop video clips to rearrange video order or playlist. Also your website users will have the option/navigation to skip or repeat certain video playback. Both Windows and Mac versions are ready to download, download HTML5 media player here. I am an evaluating user, hardly considering to acquire HTML5 media player, It looks great and helpful but when I make a test on IE 9, It asks for ActivateX component permission. I allowed it by the button which appears and it doesn't do anything. I allowed ActiveX through the browser preferences but simply can't play my video. So what can I do? I have tried another video converter, but found that this HTML5 media player software takes longer when converting the same movies? HTML5 media player is different from a general video converter. The conversion would take a bit longer than normal video conversion tools because it will convert the same video into three different HTML5 formats (webm, ogg and mp4) for maximum browser compatibility. Also a flash version will be generated for compatibility with old web browsers such as IE8 and earlier versions. We tried your HTML5 media player, it's very nice, but I also found one problem, it seems not support IE 8, do you guys have a list of supported browsers including PC and tablets? Almost all modern browsers should support the player for HTML5, such as Internet Explorer 9, Firefox, Opera, Chrome, Safari, etc. For those old browsers, such as Internet Explorer 8 and earlier versions of other browser that do not support the html5 < video > element, the output videos and players are still playable on them, it is because this HTML5 media player has the Flash fallback function. When the old browser can't recognize the HTML5 video, the flash version of the video will be loaded and played automatically. Most computers, tablets and mobile phones should support this HTML5 media player, as HTML5 is the new web standard. Here is a full list of all HTML5 player supported browsers and devices.